The Cisco ASR9901 codename "Starlord" is a fixed 2u router with no support for any MPAs. It has 2x 100G QSFP28 ports, 24x dual rate 10G/1G SFP+ ports and 16x 1G SFP ports. 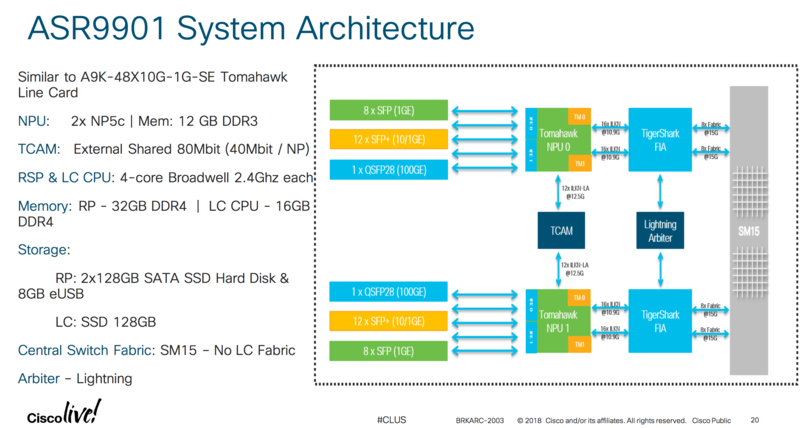 The ASR9901 has two Tomahawk NPUs with a shared TCAM. Each NPU has 8x1G ports, 12x 10G/1G ports and 1x 100G port. Tomahawk NPUs are rated for 240Gbps full duplex, 2x240Gbps == 480Gbps full duplex. However, the ASR9901 "only" has 456Gbps of port capacity so the box should be able to reach full line rate across all ports simultaneously. It actually can't though as per a standard ASR9K Tomahawk line-card layout (see RSPs/RP/NPUs) each Tomahawk NPU feeds a 200Gbps full duplex Tigershark FIA so they actually limit the throughput per NPU to 200Gbps FD. The ASR9901 supports the 64-bit version of IOS-XR "eXR" only. The ASR9901 supports front to back air flow, redundant power and fan trays. The "downside" is that the power consumption is typically in the 1200W range.